In her memoir Sonia’s Song, seven-year-old Sonia takes us along on her journey as she and her family out-run Nazis, adopt false identities, and survive one of the darkest periods in history. In 1939 Sonia’s family faced a grim option—run away or be rounded up. They ran. The family kept in the shadows, fleeing and hiding from persecution. In 1942 Sonia’s parents placed Sonia and her brother in an orphanage with more than 20 other Jewish children all disguised as Catholic orphans. Conditions were harsh and the children nearly starved. Sonia lost her childhood but gained strength and a perspective that not only sustained her through the war but gave her a message to carry out into the world. Her message is of hope, compassion, and belief in oneself. Sonia’s Song is available in paperback and e-format at Amazon. Prize Giveaway Contests: To win a signed copy of Sonia’s Song PLUS Sonia’s CD, Chansons de ma Vie, please enter using the Rafflecopter form at the bottom of this post. The giveaway contest closes this Friday, October 5 at 12:01 AM EST. We will announce the winner the same day in the Rafflecopter widget. Good luck! In the video slideshow below, Sonia sings Tunas Kaseh from her album. In postwar world, the few survivors of Sonia's family were refused citizenship status, and told that they must leave the country. Sonia immigrated to Australia where she worked in radio, television, and in film, making full use of both her linguistic and her musical talents. She organized interpreting and translating services for the 1956 Olympic Games in Melbourne, began to travel the world, translating for the United Nations in the Philippines, Singapore and Thailand. Sonia’s television and radio programs made her a sensation, and by the 1960s, she was called upon by the Queen of Malaysia to tutor her in French. While French tutor to the Queen of Malaysia, in Kuala Lumpur, Sonia continued to appear regularly on television and radio, singing, edifying viewers on classical music and speaking on women’s rights. Sonia Korn-Grimani earned her doctorate in French literature and the teaching of foreign languages, and directed a multi-cultural language program at UNESCO. With her husband John, and their children Anthony and Renee, Sonia traveled and lived all over the world. She taught foreign languages at the university level, and performed frequently to the delight of audiences worldwide. In her album Cantos al Amor, Sonia sings in 16 languages. With us today are Sonia Korn-Grimani, author of Sonia’s Song, and her editor from Clay Grouse Press, Sarah Beth Goncarova. WOW: Hello ladies, welcome to The Muffin! We are so pleased to share Sonia’s Song with our audience today. Sonia, in Sonia’s Song you share your experiences as a Jewish child during WWII and the difficulties and trauma you and your family faced. What prompted you to finally write your story? Sonia: I wrote this book for two reasons: I needed to free myself of the pain I had for so many years from losing my family who were killed under the Nazi regime; and also I needed to show my children and grandchildren what we went through, and how important it is to never forget this terrible dark period of history. WOW: You tell your story through the eyes of your younger self; what were the benefits to that as a writer? Sonia: Because by writing it in the present tense, it was much more vivid and not so distant. Sarah Beth: We wanted the reader to feel like they are there with Sonia, sharing her experiences, seeing what she saw. One of the many things I love about the book is that the reader grows along with Sonia as she matures. WOW: I was both pleased and surprised by the grace with which you tell your story. I’m certain that in writing this memoir you revisited some difficult emotions—how did you work through them to write from a balanced perspective? Sonia: With difficulty. To find a balanced perspective I had to find a peaceful corner. Curiously enough I found it during my long rides on the Parisian Metro amidst all the strangers who paid no attention to me. I took out my notebook, I closed my eyes for a few minutes, meditated, then I let my pen frantically fill up the pages with my memories. I often missed the Metro stop of my final destination, but it did not matter so absorbed I was by my inspiration. WOW: Sarah Beth, you and your husband have been very “hands-on” promoting Sonia. Would you share with us your experience publishing Sonia’s Song? Sarah Beth: It has definitely been a labor of love. We spent a year in the editing process alone, including conducting close to 30 hours of interviews drawing out some of the memories that Sonia hadn’t really talked about in the German and French versions of the memoir. But we spent such a long time on this part because we wanted Sonia’s remarkable story to really shine. Promoting the book has also been a challenge, but well worth the struggle. We’re learning as we’re going. We’ve been trying to be as creative as possible in promoting her work, by creating YouTube videos with her music and old photos, and by recording Sonia reading several chapters from the book, which we are releasing by chapter on YouTube. We’ve also created a CD, Chansons de ma Vie, which is a beautiful collection of over 20 of her songs, all digitally re-mastered. The music, which is so important to the story, adds a whole new dimension to the experience of reading the book. WOW: The music really is wonderful. Sonia, would you like to tell us a little bit about the songs on this album and what they mean to you? Sonia: They are mainly popular songs from the fifties and the sixties. As I traveled all over the world, I chose songs that were emotionally and romantically appealing to me from every country I visited. WOW: I would be interested in reading about your life after the war. Are there any further books or music releases planned? Sonia: I wish to let a little time go by before tackling another book. About music releases, I do not know, the future will tell. WOW: Sonia, if you had one message to offer to our readers today, what would it be? Sonia: To never lose hope, even in the face of adversity. Believe in yourself and in your dreams. Never lose faith in yourself. WOW: Beautiful. Thank you, ladies, for sharing your thoughts with us today. Readers, below is a video of Sonia reading chapter one of Sonia’s Song. Be sure to fill out the Rafflecopter form at the end of this post and visit the blog stops for more chances to win. This is an incredible story and a powerful memoir you'll want to read. Sonia Korn-Grimani, author of Sonia’s Song, shares her thoughts on living life to its fullest! 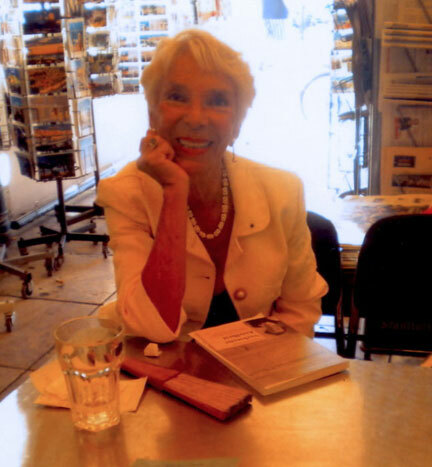 Enter to win a signed copy of Sonia’s memoir. She lost her childhood and many members of her family during WWII. Join us for a guest post from Sonia Korn-Grimani on the power of love and forgiveness. Enter to win a signed copy of Sonia’s Song! An inside look! Sarah Beth Goncarova and Yary Hluchan, the two editors of Sonia’s Song, share their thoughts and favorite passages. 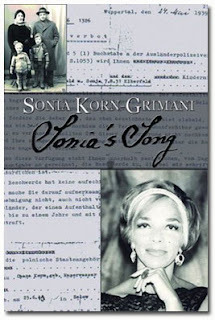 Sonia Korn-Grimani wrote Sonia’s Song from the memories of her seven-year-old self. Today she shares the challenges of writing an adult book from a child’s point of view. Sarah Beth Goncarova and Yary Hluchan, editors of Sonia’s Song by Sonia Korn-Gimani, share more of their favorite scenes. Enter to win a downloadable gift bag consisting of an ecopy of Sonia’s Song and her music CD. Join us for a mass-blogging party! Bloggers everywhere will be joining us for a symphony of positive stories and uplifting content today as we explore the topic of Finding the Music in Life. Enter to win a copy of Sonia's Song! Author Barbara Barth shares her review of Sonia’s Song by Sonia Korn-Grimani. Sonia Korn-Grimani survived the Holocaust and became an internationally renowned singer! Today she shares her thoughts on the power of determination and positive thinking. Join Mason Canyon for a review of Sonia’s Song and a giveaway! 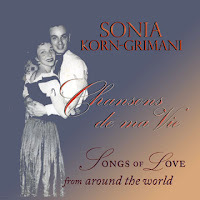 Enter to win a downloadable gift basket which includes an ecopy of Sonia’s Song and a download of her wonderful album, Chansons de ma Vie. Is it haunting? Is it magical? Come enjoy this review of Sonia’s Song and enter to win a giftbag which includes an ecopy of this poignant memoir and a selection of love songs from around the world. Join us for a post about the importance of believing in yourself by Sonia Korn-Grimani. Enter to win a signed copy of Sonia’s Song! Thinking of writing a memoir? Join us as Sonia Korn-Grimani talks about turning memories into story! Enter to win a downloadable gift bag of story and song. Does Sonia’s Song pass the test? Editor and Author Margo Dill shares her review! Come enjoy a reader’s review of Sonia’s Song and enter to win a gift bag of story and music! Book Giveaway Contest: Enter to win a signed copy of Sonia’s Song ($19.95) and her CD, Chansons de ma Vie ($12.99)! Just fill out the Rafflecopter form below. We will announce the winner in the Rafflecopter widget this Friday, October 5. This sounds like a moving memoir. A couein of mine spent part of his childhood in a concentration camp, and the stories he could tell...if he was healed enough to be able to talk about it. It was wonderful to hear the autheor sing, as well as read part of her book aloud. This was a marvelous post. I have nothing but the utmost respect for Sonia, her struggle through the Holocaust, and her gift of music (which I wish I had!). I cannot imagine having to live through such a horrible time, and you came out on top. I cannot wait to read your book, and I am so honored that I get to host you on my blog! Was this as hard and sad for you to write, as it was for me to read? Thank you everyone, for your kind thoughts! It was a great struggle for me to write, in part because I had suppressed some of the most traumatic experiences, and in part because I felt tremendous guilt telling the story, simply because I was alive to tell it. But I felt that no matter how hard it would be, that I should write it down, at least for my children and grandchildren to know. What an amazing story and amazing person Sonia is! all I can say is wow! Sonia, you have such a gorgeous voice! I know it must have been incredibly hard to tell your story, but I admire you for putting pen to page so that others could learn from your experiences. Thank you for sharing your heart. What part of your life is affected most by this story? Thank you for all the input. It is so nice to hear from so many people! With regards to Heather Turner's question- The answer would be my stay at the Orphanage, not only for reasons in the book, but also because we are friends to this day. We still talk and meet whenever we can. Also my leaving Europe for Australia, leaving the old world for the new broadened my life tremendously and helped me rediscover my true self.